I learned something new. Pineapple symbolizes hospitality and welcome. My bride, Brooke seemed to think this was common knowledge. And maybe it is, but I had no idea! Initially she was undecided between a magnolia and a pineapple. At the sample review, she ultimately chose the pineapple. I love this save-the-date almost as much as I love Brooke. 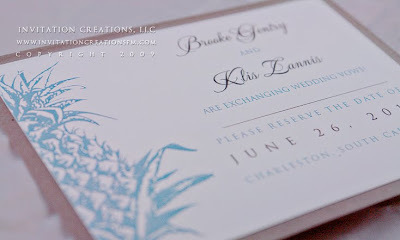 Brooke is a referral from one of my all-time favorite brides, Melissa. This design she chose was a stretch for her. It's a little on the modern side, but it seemed to grow on her and I was secretly hoping she would choose it since it was my favorite one. Though Brooke is more conservative than Melissa and I are, we get along so well. Half the time we get sidetracked and get to chatting like old friends. I've got to say meeting all kinds of interesting people is one of the perks of my job! And thank you Melissa for another wonderful referral!